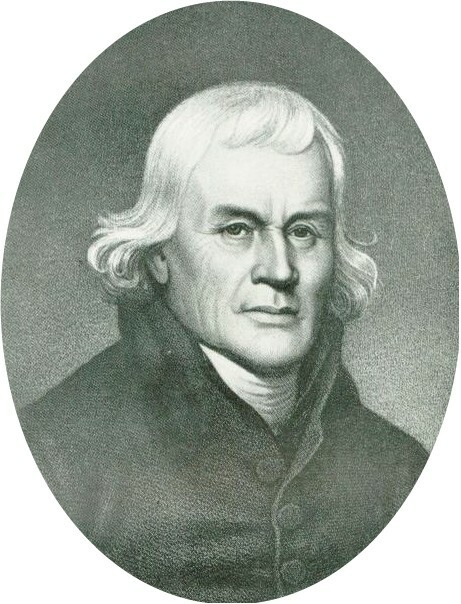 Francis Asbury Biography, a short version. For a more detailed treatment go to the main page for Francis Asbury biography. Known for his motto, ‘I must Ride or Die,’ he soon becomes the most recognized individual in the colonies, journeying to the colonies’ largest mansions and many of the humble dwellings on the frontier. His efforts uniquely cross denominational and ethnic boundaries as well. Francis is a man ahead of his time. 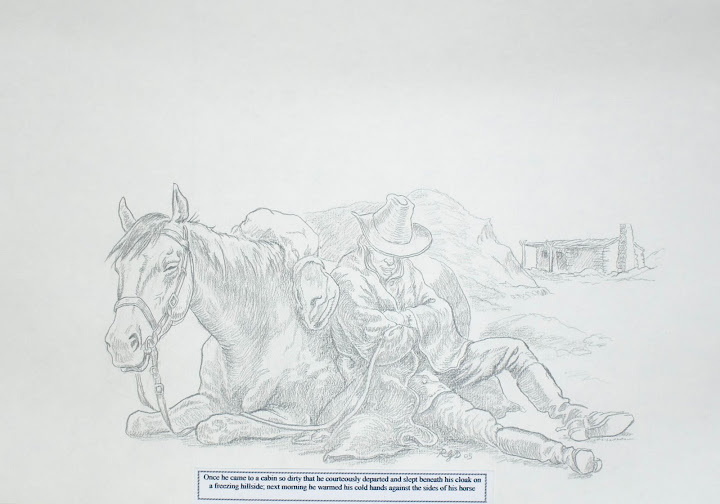 The Richard Douglas sketch of Asbury, sleeping outdoors and leaning against his horse symbolizes the man. The life of the young, inexperienced preacher from England’s iron-working industry without mistake embodies the concept of perseverance. The hard work of his six-year apprenticeship in the iron-working trade seems to have prepared his body for the rigorous life he will embrace in the colonies. Once on the American shores, he labors in the saddle, (never owning a home), until his death 45 years later. In a way, Francis Asbury is America’s British founding father. Born to loving parents in 1745, Francis spends the first 26 years of his life in the blue-collar region of the West-Midlands in England. He is reading the Bible at the age of 6 enters the iron-working trade by 13 and preaches his first sermon before he is 16. 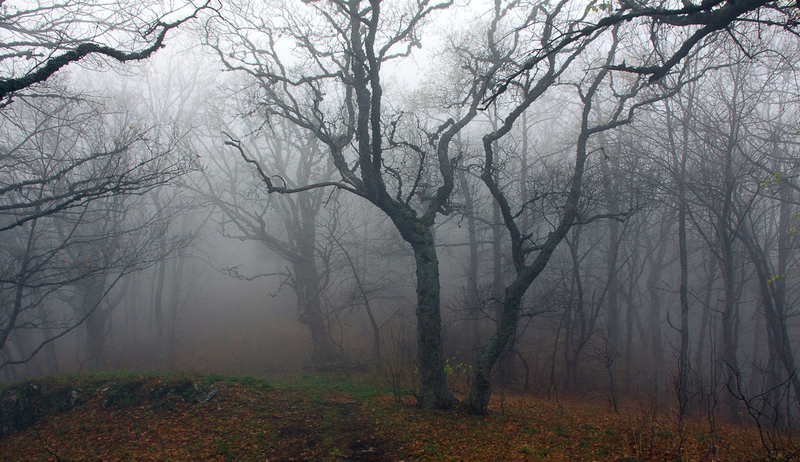 By 26, he is abandoning his family, his friends, his girlfriend and his homeland for the wilds of the American Colonies. 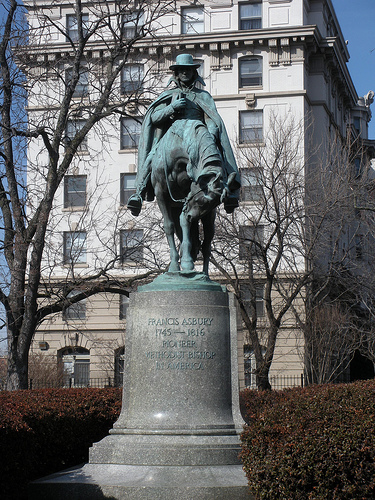 Numerous cities, towns, streets, universities, churches, schools and children claim the namesake of Francis Asbury. The Methodist names of the streets of Asbury Park, New Jersey give honor to the man. Stained glass works of Asbury adorn churches. There is also a large equestrian monument of him in Washington D.C.
Asbury is a leader of men; his faithful followers are a Biblical cavalry. In lieu of fine churches, they preach in houses, barns, taverns, jails, courthouses, orchards, playhouses, poorhouses, forts, marketplaces, African churches, and Indian settlements, on the banks of rivers, in the woods, among the pines, at the gallows, outside of universities and schoolrooms, from carriages and wagons and when circumstances require, from jailhouse windows, (yes, several of his itinerants experience time in prison). In addition, during the Revolutionary War, Asbury and his mighty men occasionally find themselves preaching at the front line, dodging volleys of gunfire.